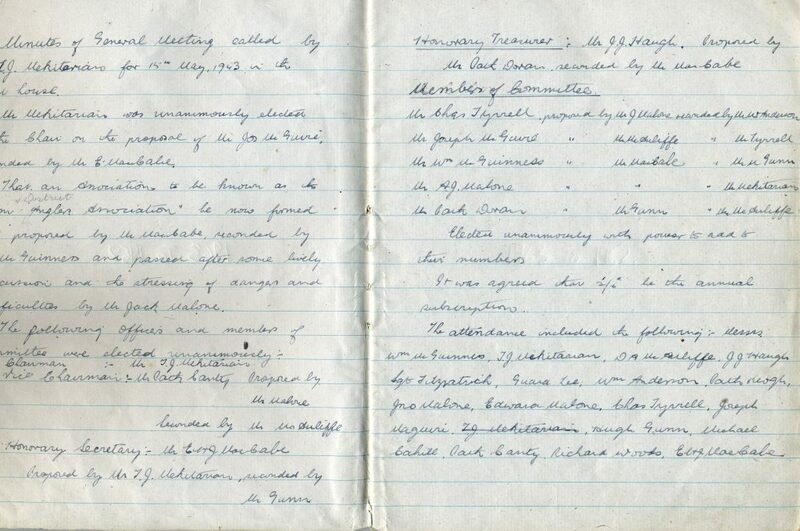 A copy of the minutes from our inaugural meeting in 1943. The Trim, Athboy & District Angling Association was established in 1943 – celebrating 75 years in 2018! Our website is aimed primarily at members and friends of our club and those who take an interest in the preservation of salmon and trout in such portion of the River Boyne and its tributaries as may be acquired by the Association from time to time. The club members elect the and committee at each AGM. This team undertakes constant management, monitoring and upkeep of the fishery and club all year round, so any support is greatly appreciated. The officers and committee meet the first Thursday of every month, so if you have suggestions or input, we can discuss this at our monthly meetings. We have created a development plan in order to put the Boyne system back to where it belongs as one of the premier fisheries in this country. We run several trout competitions each year which double up as a social event to meet other anglers. These competitions are an essential part of the club's activities and are very informal, friendly and enjoyable occasions. A limited number of day permits are available each day in the fishery. View some of our old and new photos from over the years.